Anywayyy..we'll start with some pretty shimmery stuffs. I've heard about Makeup Geek thanks to my fellow beauty blogger Wiida and also other beauty Youtubers that I subscribed to. Somehow I found out recently(last month)that they were giving free shipping worldwide and I of course grabbed the opportunity to buy some.Now our currency wasn't at it's best against USD but still it was too great of a deal to miss out on. I quickly asked Wiida which one should I buy and I limit myself to only two eyeshadows which came up to about rm70. I bought Cocoa Bear and also one from the foiled collection in Grandstand.They arrived within 2 weeks. I definitely love both of them and understand why people rave about the eyeshadows.They're buttery smooth,blend well,great pigmentation and looks amazing on. If only the shipping isn't expensive..I'd definitely buy more! Wearing just cocoa bear,very lightly. Cocoa Bear is a beautiful reddish brown matte eyeshadow that just looks good on my eyes.I've worn them a few times and got compliments for it.I love wearing this shade for everyday,especially when I'm lazy to put on liquid eyeliner.The color gives some depth to my eyes. This shimmery eyeshadow is just sooo beautiful.There's not glittery fallout either and it's finely milled.I just love love love it!I really want to get more from the foiled collection.I've worn both Cocoa Bear and Grandstand together and they look beautiful. My verdict is for Makeup Geek is..go and buy it!If you can,please purchase it because they're awesome.If given the choice,I would definitely buy more from them. Color Pop is a brand that I came to know from one of my favourite Youtuber,Kathleen Lights.I ordered them from this instagram shop that belonged to a fellow blogger of mine.I bought two of Color Pop's matte liquid lipstick in the shades Bumble and Donut. The matte liquid lipsticks are very matte and they last a long time.A word of caution though if you have any bits of dryness on your lips,better scrub and moisturize them well before applying the lipsticks. This is a deep brick red color(brown red) and it goes on smooth on the lips.Unfortunately the color doesn't look good on me so I gave it to my sister in law.I love the color but on me it made my complexion looked sallow. 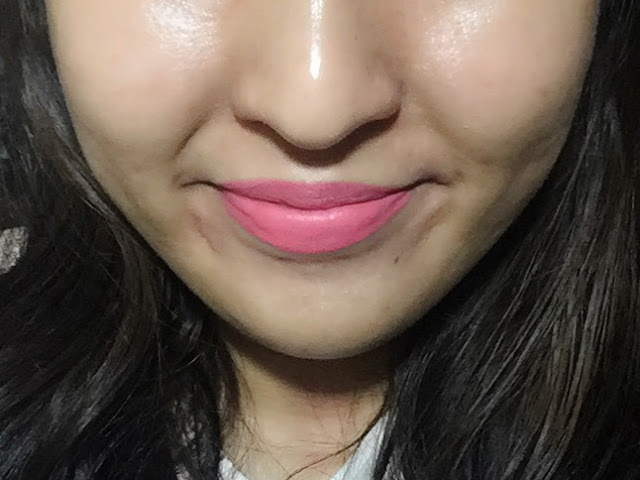 I loveeee this color and it's a great color on me.Unfortunately,it's very drying compared to Bumble.I've no idea why and I'm not making this up as my sister in law tried it and she also complained about how drying it is.Whenever I want to wear it,I've to make sure that my lips is very very smooth. But the great thing about these liquid lipsticks is that they last a long time.You've to use an oil based remover to get rid of it...even when I use Bioderma, it requires vigorous rubbing. I love that they also don't have a weird paint scent to it like L.A Girl has.If only Color Pop ships to Malaysia.That'll be awesome! I would definitely want to try more colors from Color Pop ultra matte liquid lipstick! I love donut too and you look good with it.